This volume contains the proceedings of the international seminar dedicated to the scholarly contribution offered by Dr. Ilya Gershevitch (Cambridge University, England) to the development of Iranian Studies and held in Ravenna, 11th April 2003, on the second anniversary of his sudden death. Most of the papers published here belong to scholars being direct pupils, colleagues and friends of the late Dr. Ilya Gershevitch. The variety and complexity of the subjects represented in this volume actually reflect his most significant scientific interests and the wide and extraordinary competence of this great protagonist of Ancient, Middle and Modern Iranian studies. 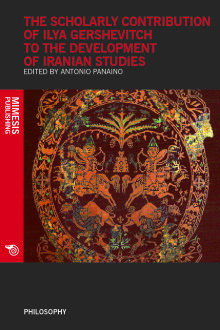 The range of these contributions involves, in fact, the following areas of research: Avestan literature and Zoroastrian religion (Prof. A. Panaino, “Alma Mater Studiorum – University of Bologna”; Prof. M. Schwartz, “Berkeley University”; Mr. F. Vajifdar, London), Old Persian (Prof. A. V. Rossi, University of Naples “L’Orientale”), Eastern Middle Iranian languages like Sogdian and Bactrian (Prof. N. Sims-Williams, “SOAS”, London; Dr. E. Morano, University of Rome “La Sapienza”), Manicheism (Prof. W. Sundermann, “Turfanforschung” and “Freie Universität – Berlin”), modern West Iranian dialects (Prof. E. Filippone, “Università della Tuscia”), and Ossetic (Dr. P. Ognibene, “Alma Mater Studiorum – University of Bologna”). Two brief introductions to the proceedings of this conference are by Prof. A. Panaino and Prof. Gh. Gnoli (University of Rome, “La Sapienza”). Antonio C. D. Panaino is Full Professor of Iranian Studies at the “Alma Mater Studiorum – University of Bologna” and he is presently Dean of the “Faculty for the Preservation of the Cultural Heritage” in Ravenna.